Do users still get the “package” when their rep reaches 100k? What do I get with 100k reputation? My rep hit 100k about a couple months ago. However I haven't received "the email" described in above Q&A. Just come to ask, if the thing mentioned in above answer is still valid? Today 4th May 2016, I received the package from SO. So it is proving that the thing is still valid. Yes, we still process swag requests for users who hit the 100,000 mark and the 250,000 mark. Assuming you have a valid email address on your profile and you are opted in to receiving emails from us, you should get an automated email within a week of hitting the reputation threshold. If not, check your spam folder and make sure it didn't end up there. If you still haven't heard anything after a couple weeks, feel free to send us an email directly at community-support@stackoverflow.com mentioning you hit the threshold, and we'll reply with some instructions for the information we need to process the request. As far as actually processing them, it is a manual process. The email contains a link to a form that, once submitted, sends all the information to our support queue for processing. There's not really a timeline for how long it'll take to get processed - it's completely dependent on how much other stuff we have to do / what's going on at the time. Sometimes requests get processed within the week, sometimes it takes a couple months. TL;DR: I received one a "long" time ago, and I can confirm it was "6 to 8 weeks" after I went over 100k. I cannot check when I first hit the 100k mark, but I received an email from a Stack Overflow employee in September 2014 about it, and it may have taken a couple months before I finally got it... but get it I did. Got The Package when I reached my 100k ~6 months ago. As far as I remember, the email arrived within a few days after reaching the threshold. As far as I know, no. I received no email and no package. Received email within 24 hours! Package delivered to me in 7 days! Package delivered by DHL Express Shipment. As of Feb 2017, 100k rep SWAG is still being delivered to happy users such as myself. I passed 100k rep on Stack Overflow on 2/15/2017 and received the "You're killing it" email within 24 hours. I filled out the swag form the next morning. I got a shipping notification on 2/22/2017 and FedEx delivered the package on 2/27/2017. 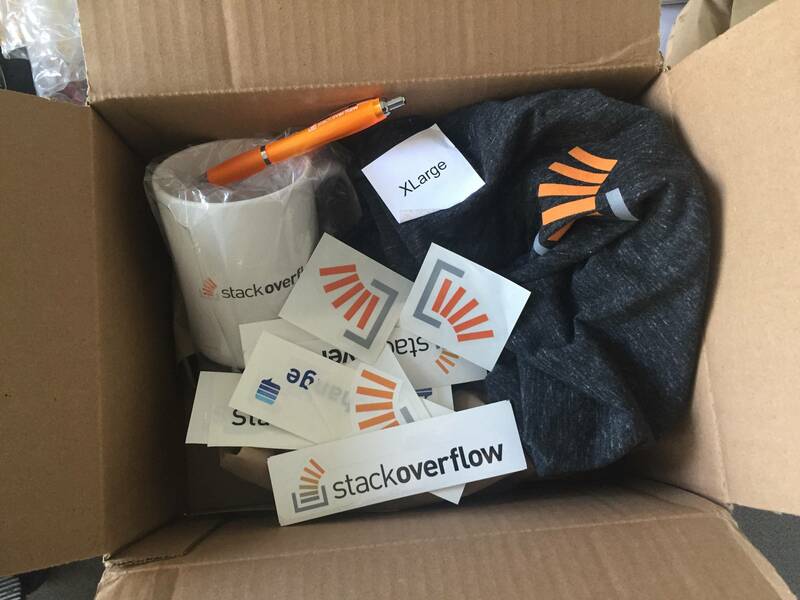 Elapsed time between passing 100k rep on Stack Overflow and receiving SWAG: 12 days. Much faster than the 6 to 8 weeks others have quoted. Thanks, Stack Overflow team! I posted some pics of my 100k SWAG on Twitter. Not the answer you're looking for? Browse other questions tagged discussion reputation swag . 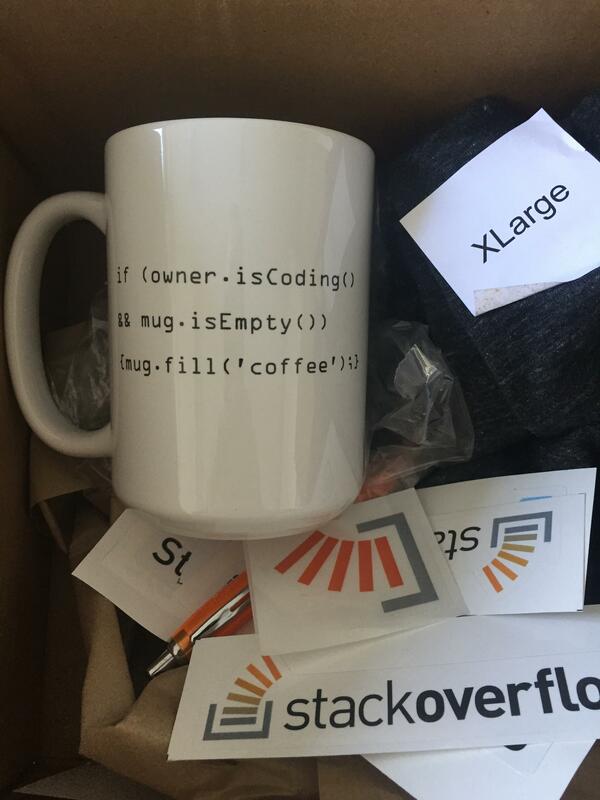 Where is my box of Stack Overflow swag? 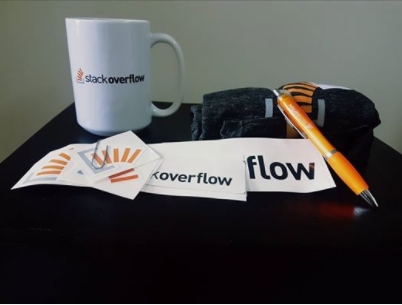 What are the dynamics of the Stack Overflow community? Can we have Stack Overflow shop where people can buy stuff using points? Do users get rep for downvoting questions? What to do when a high-rep user is willfully breaking site rules/meta consensus? 10 Million Questions Giveaway - What happened? Is it OK when users receive rep for the edit and not for the their original answer? What happens when users reach 1m rep - does Stack Overflow do anything to reward them? Do the reasons that the daily rep cap was imposed actually apply to high-rep users?